Welcome to Fitness & Fishnets! Interviews, strategy, and insight help you get results without sacrificing your sanity, joints, or love of cheese. Interviews, strategy, and insight to help you get results without sacrificing your sanity, joints, or love of cheese. Subscribe to the podcast and never miss an episode! 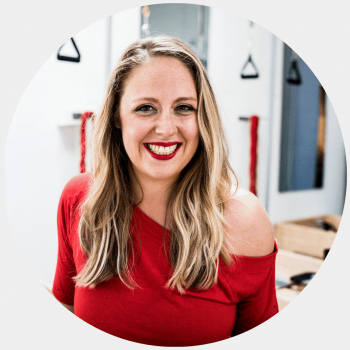 Nikki Naab-Levy PMA®-CPT is a Pilates teacher and certified functional strength coach with over a decade of experience helping clients build strength and overcome injury. She holds B.S. in Exercise Science and B.S. Journalism from Ohio University and was second place in the 2018 Next Pilates Anytime Instructor Competition. Her fitness wisdom has been featured in Girls Gone Strong, The Seattle Times, and Men’s Fitness. She is a Master Trainer for the Balanced Body Bodhi Suspension System. When she’s not teaching a sneaky hard Pilates class, you can find her hiking in the Pacific Northwest with her corgi Charlie, reading trashy vampire novels, and chain-drinking Americanos.